Kegel 9-Pin Bowling - Looking for something a little bit different? Try your hand at 9-pin bowling, the original worldwide bowling game that dates back to the 11th century. If you like 10-pin bowling, you are in for a treat. For those new to 9-pin bowling or experienced bowlers looking for a challenge, it’s bowling as you’ve never known it! Small children are also catered for as the interactive scoring board has a children’s menu. As the sun goes down, the bowling centre transforms with glow in the dark lanes, pins and balls providing a whole new dimension to your Island Bowling experience. The centre boasts seven lanes, an amusement arcade and a fully licensed bar. Grand Prix Go Karts - One of the things you don’t expect to find on a tropical island is a Go Kart track. It’s great fun for the entire family and no licence is needed. Driving Range - Golfers can practice their swing at Hamilton Island at a unique Golf Driving Range where the object is to actually hit golf balls into the water. For some family golf fun, guests can have a hit of mini-golf. Serious golfers may choose to opt for a short flight or ferry/road transfer to nearby Laguna Quays for either 9 or 18 holes at the Turtle Point Golf Course, considered one of the top 3 courses in Australia. 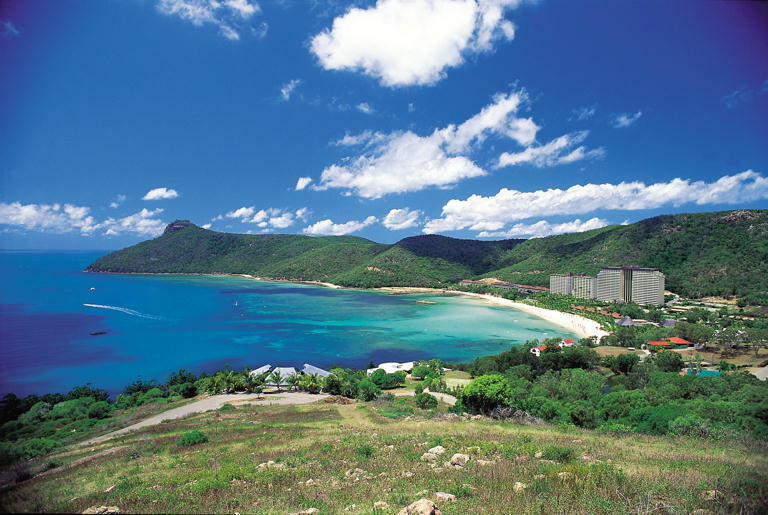 Target Sports - Hamilton Island Target Sports is a professionally operated shooting range with Clay Target shooting, small bore rifle range and pistol range. The secure complex is fully supervised by safety conscious staff who will show guests how to use Dirty Harry’s .44 Magnum, Danny Glover’s Lethal Weapon – the .357 Magnum or the 9mm Taurus used by Mel Gibson’s Lethal Weapon character. Koala Gallery Wildlife - The Koala Gallery Wildlife Experience at Hamilton Island is a great place for families and international visitors alike. Guests can hand-feed kangaroos, cuddle a koala, pat a wombat, feed the beautiful rainbow lorikeets and watch the crazy antics of the cockatoos in a daily show. During the warmer months, a feature of the Koala Park is the daily feeding of its resident crocodile. You may also have breakfast with the koalas and participate in educational tours of the park. ‘Creatures of the Night’ once-weekly tour at 6:30pm is a special spot-light tour to see many of the active night animals. Clownfish Club - The Hamilton Island Clownfish Club incorporates a Senior Adventure Room operating exciting excursions for children ages 5 - 14 years and a Junior Childminding (6 weeks - 4 years) which is fully licenced with the Department of Families, Youth and Community Care. Parents can relax knowing that their children are enjoying safe, supervised age-related adventures including arts and crafts, beachcombing, snorkelling, hiking, fishing, mini-golf and pool games. The walk to Passage Peak - Passage Peak is one of the highest points in the Whitsundays with magnificent views over the islands. The bush walk takes approximately 2 hours along a well-marked trail. It is quite challenging in parts so guests are recommended to take ample drinking water with them. Once you reach the summit, there is a table where you can enjoy a picnic or snack and take in the spectacular beauty of the region. 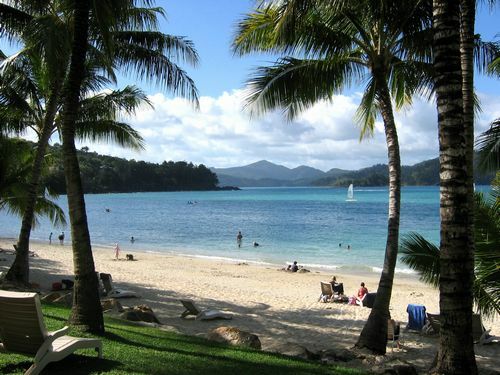 Safari Twilight Aussie BBQ Tour - The Safari Tour at Hamilton Island offers guests a relaxed Aussie holiday experience which starts with a 4WD truck tour to the resort lookout for some sunset champagne and nibbles. Guests are then transported to the secluded Coral Cove for an Aussie BBQ and campfire singalong. Luncheon tours include snorkelling and swimming at the secluded south end of the island or the Beach Tour allows you two hours to see another part of the island. Sports Club - Fitness fanatics can get a work-out while on holiday at the squash and tennis courts, take an aerobics class or use the brand new free weight & machine weight gymnasium area, including state of the art electronic cardio equipment. The Sports Complex includes gym, spa, sauna, squash, tennis and mini golf. 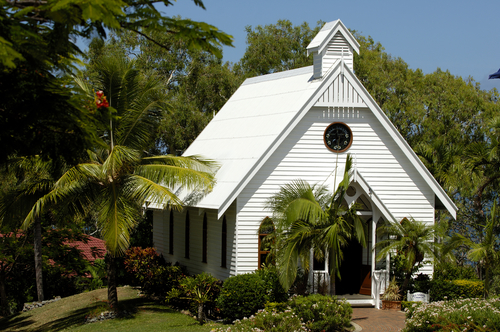 Weddings - Each year, over 450 couples waltz down the aisle of the quaint All Saints Chapel at Hamilton Island. The team from Hamilton Island Weddings arrange all aspects of the wedding including the church, flowers, photography, video, hair and makeup, gown and suit hire right down to the Rolls Royce transfers to the church. All you have to worry about is getting to the church on time! 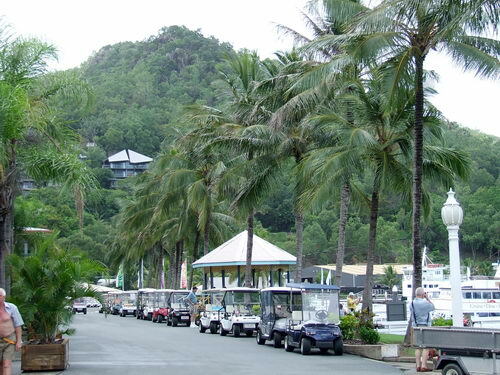 Shopping - From souvenirs to fashion – Hamilton Island has a range of shops on both the resortside and harbourside of the island. Facilities include a newsagency, TAB, resort fashion, florist, pharmacy, general store, Australia Post, National Australia Bank, jewellery store, takeaway food outlets and tax-free souvenirs.